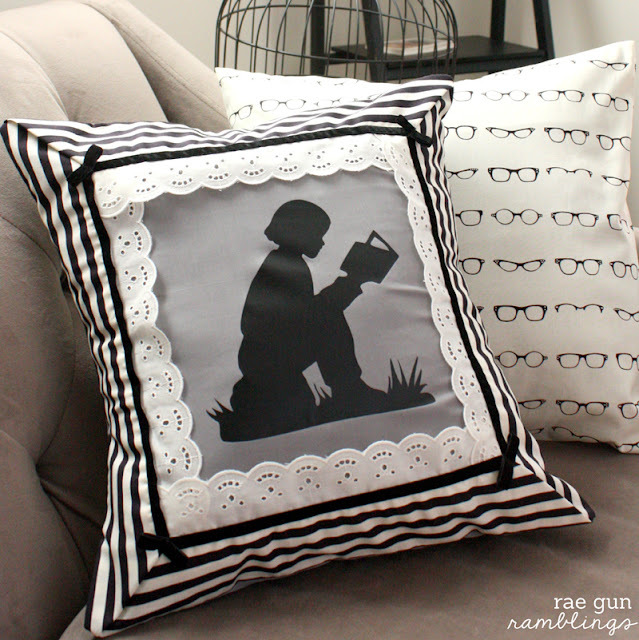 I have been wanting to make some book nerd pillows to have when the book club comes over but I kept on putting it off. 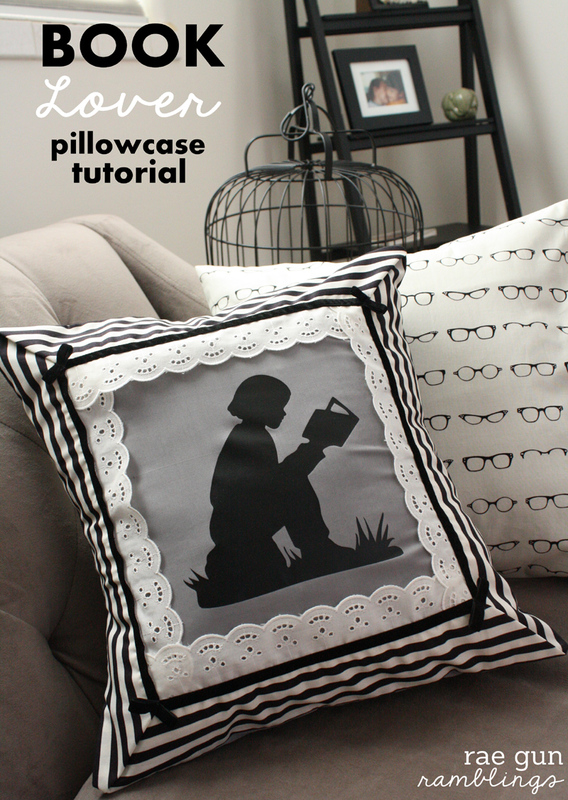 Luckily I had the chance to try out Cricut‘s brand new iron-on vinyl and it was the perfect chance to finally make my book lover pillowcase. First off you know how I’m obsessed with freezer-paper stenciling, well this vinyl stuff gets what I like about that technique only it involves way fewer steps so it’s faster and easier. Also it’s more precise. Unlike with painting where it’s so easy for the paint to slip through the stencil and just look a little off the vinyl always looks perfect. Really I am so obsessed with the stuff it’s definitely a new favorite staple in my craft room. I decided to use it to make a few pillowcases. My favorite is the one that reminds me of one of my most loved books, The Night Circus. It’s such a beautiful elegant story and there’s a lot of black and white imagery throughout the tale. First cut the image out of the iron-on vinyl. I used my Cricut that I got around Christmas and I really like how it works with the online Cricut craft room All I had to do was search books and it pulled up the reader image from A Child’s Year cartridge (my favorite Cricut cartridge actually). The vinyl comes with a protective plastic over it and you want the plastic (shinny) side to go down and the vinyl (matte) side to be up on the mat. After you cut the image set it aside. My pillows are 17″ squares so I’m going to do the measurements based on that. If you want to make a different size pillow case you can change the measurements. See my basic pillow case tutorial and that will give you an idea on how to manipulate that. I used a piece of fabric 17″ by 38″. From that I cut a 17″ square. I cut the remaining piece in half leaving me with a piece 17″X17″ and two pieces that were each 15.5X17. Take the square piece and your accent fabric. Make a 2 yard by 3 inch strip of fabric out of your accent fabric. 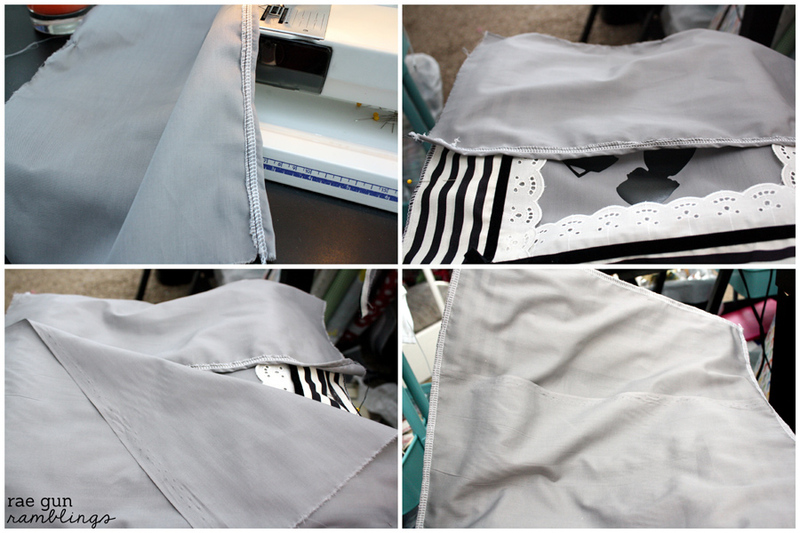 Lay the accent fabric around the edge of the pillow folding and tucking under when you come to the corners. Pin as needed. 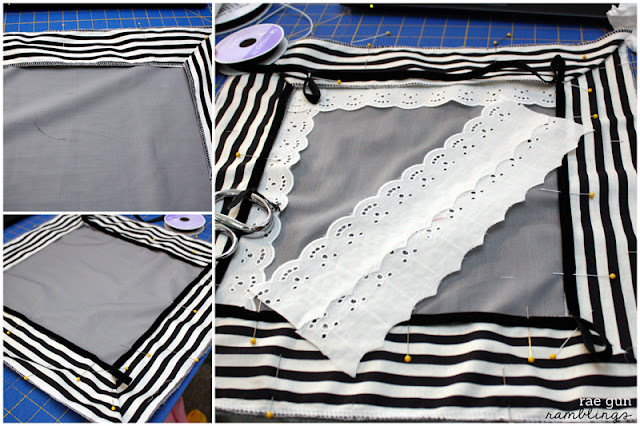 Next cut your lace into 4 strips that will fit under the edge of the accent fabric I did mine about 11 inches long. Tuck the lace under the accent fabric and pin. Next push down the loops so they are folded with equal amounts on both sides of the fold. Using a zig zag stitch to catch both folded sides sew down the middle of the ribbon. This makes the cute bow accent. Now take your vinyl cut-out and with the shinny side up position it on your pillow. 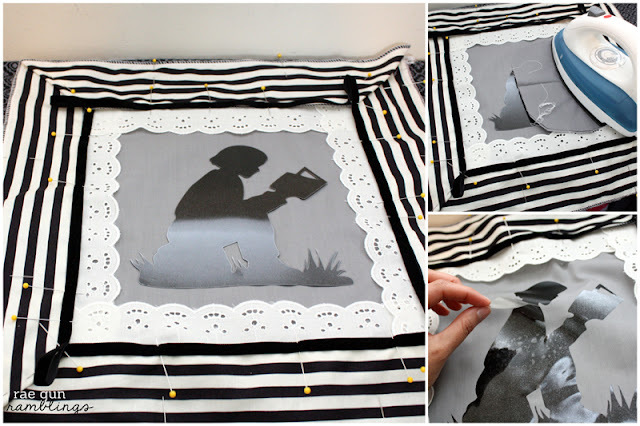 Using a scrap piece of fabric on top of the vinyl, iron down by pressing and holding for 30 seconds until all parts of the cut-out are affixed. Then flip the pillow over and repeat the 30 seconds ironing on the back side. Then lay the back pieces on the square front piece right sides together and pin. There should be a decent amount of overlap with the back pieces this forms the “pocket” of the pillow. Sew all four edges. Then flip the pillow right side out and iron the edges and stuff with a pillow form. And now you have a sweet book lover pillowcase. Lovely! I love your blog. I wish you lived in my area and we could hang out and make stuff:) My only suggestion with the pillow is that I would try to add in a scarlet scarf. I wanted to make scarves for my club but never had the time. My book club read the book a while ago and I have never fallen in such love with a book or a writer! LOVE LOVE LOVE..I know this isn’t a book review, but I can’t help myself. Your pillow is beautiful. I’d love to try it. Outside of the topic, I have also just read A Discovery of Witches by Deborah Harkness because it was recommended since I love The Night Circus so much. I’m starting the 2nd book now…love it! You might too. Shut up! That is gorgeous! I love the Night Circus pillow. I would totally buy one. It would be cool with a circus tent in the center too or a ferris wheel for divergent! Awwww thanks! I’ve definitely been considering adding some bookish pillowcases to the shop. I will keep you posted if it happens. And I totally had a Ferris wheel on the list haha great minds right?! I love these! They are so cute. You should consider selling it on Etsy. Marissa, which app do you use for your post sharing? My one is small icons but I’m quite sure it’s not these same icons. It’s called addthis if you scroll over one of the buttons then look in the bottom left of the pop up there’s a little link to them. Your pillow looks just like something out of The Night Circus!! So fun! Oh I LOVE them all!! The silhouette is so gorgeous and I love the other two as well! Tooo cute! How pretty is that? I love your pillows! Especially the silhouette:-) I can’t wait to check out everyone’s projects! 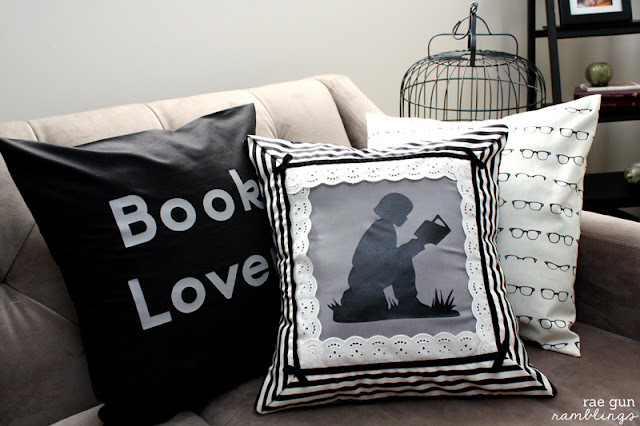 I love all of the pillows and can see them in a wonderful little corner for reading! Cute pillow! I love the black and white stripes and the lace! You have been featured at The DIY Dreamer!! Come on over and grab your featured button.. you deserve it!! book nerds, here here! i love that book so much. what are you guys reading now?